The United Nations has declared today World Autism Awareness Day. Excellent! I had the opportunity to work with a group of young adults on the Autism Spectrum, and in order to get ready, I read everything I could get my hands on. Autism has been described as a form of “mind-blindness” by British psychopathology professor and researcher Simon Baron-Cohen … as a lack of function in the mirror neurons that help us empathize with each other. I thought, huh, will I be meeting people who are on the other end of the spectrum from me? As it turns out, Autism isn’t that simple, and I didn’t find complete mind-blindness in my autistic friends. Rather, what I saw was a group of people who were dealing with incredible sensory stimulation, both from the outside world, and from their own brains. This often created a great deal of emotional turmoil, as you can imagine, but because there were so many communication and socialization challenges, it was hard for my friends to deal with their often intense emotions. Some would completely withdraw, some would engage in “stimming,” which is a repetitive action that brings some sense of peace and control, and others would sometimes lash out. It is also not a concrete condition, which is why it is referred to as a spectrum condition. There are many possible versions of it, and each person on the Autism Spectrum is an individual, just as we (who are called neurotypicals) are. I love the term neurotypical. It makes us sound boring, which we often are! I heard some of the parents of my friends use the word neurotypical as a kind of slam, “A neurotypical wouldn’t ignore a direct question, so wake up!” Ouch! I began to talk about neurotypicals in joking ways around my friends, “Oh, how tedious and neurotypical you are!” It was a good laugh getter. If you’ve got an Autistic person in your life, celebrate them today (in a quiet way so you don’t overwhelm their ears!). It’s tough to be surrounded by tedious neurotypicals who don’t even realize that the whole world is engineered for their comfort. I just finished a book called Unwritten Rules of Social Relationships by Sean Barron and Dr. Temple Grandin. It’s a fascinating look at two individuals who are on very different places in the Spectrum. 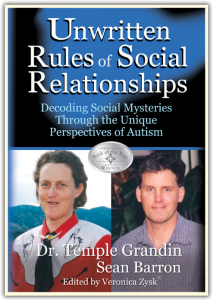 Interestingly, Sean Barron, is a male whose inner experience of Autism was extremely emotional, while Temple Grandin is a female whose inner experience was and is primarily unemotional. I found myself arguing with Temple as I read, because she’s holding on very tightly to the old “emotional versus rational” idea that isn’t supported by current neurological research. We can’t be rational without our emotions; but I understand her struggle to overcome an emotional functioning that was overwhelming and totally not helpful to her. It’s nice to have Sean’s more emotional perspective to balance the book and the portrayal of what people on the Spectrum deal with emotionally and psychologically. It’s a great book to read if you want to understand more about the Autism Spectrum, and more about how we neurotypicals intuitively understand social rules even though we weren’t directly taught about most of them. Here’s the rub: We understand these rules because they were created by us, for our kind of minds … it’s not because our social functioning is objectively correct or better than any other way. This is a good book for opening the mind and discovering yet another “reality” (social rules and social functioning) that is merely socially created! Dynamic Emotional Integration® begins in April! I saw a film called Autism: The Musical. It was very educational. I learned a lot about Autism. I saw that one too. The focus seemed to be about making the kids act more like neurotypicals, and I wondered what kind of performance the kids might have put on if they had been in control of the script. Of course, some of the kids would just recite endless stories about trains or dinosaurs, but with some sensitive direction, it could be a real eye-opener and an invitation into the world of the spectrum. Drama rocks! Hi Karla, I am a certified co-active and servant coach, as well as a non-traditional advocate as I speak and have people “try-on” disabilities or challenges, venue dependent. Additionally, I’ll tell you that my son has high functioning Asperger’s. I agree with you that he recognizes emotions and is quite empathetic, dispelling the myth. That said; I must reveal that it is learned behavior, for him. He has his stock things said with endearing inflection which is a mixed bag. He has learned appropriate responses to get by in the neurotypical world, yet short circuits too. Due to his high functioning, people tend to view him as someone with something that they just can’t quite put their finger on. Other children whose families I used to traditionally advocate for showed me the reality of the snowflakes in this spectrum. Taking additional trainings in how people view perspectives and social thinking has helped me to help others understand this. It’s interesting for sure. I was drawn to The Language of Emotions for reasons that have nothing to do with Autism, yet do find the value of it to relate and educate others. I am a huge fan of yours and greatly appreciate that you mustered your courage, your gifts and have written a book that brings so much value to putting a positive side to work through emotions. While I appreciate Universal Law and principles, so many of my colleagues are into the mantra of “Let it Go” without experiencing it. I know from my self, from my clients that unless it is worked through, it simply “upchucks”! Naturally, your writing speaks to me – BIG TIME!!! I have been studying it like a bible as my background is also sociology and I’m a junkie for this stuff; yet mostly appreciative of the format to check into easily when particular emotions arise. I consider myself a combo of all my mentors. I know I am a benefit to my clients for this and am thrilled to add my Karla McLaren lessons to them. I’m touting your book to many. Thanks for the GREAT READ! Hi Mo, thanks for writing in. I’m really thinking a lot about teaching emotion recognition to people on the Spectrum, since so many of them that I know have really good systems thinking skills. Emotions are a system, and they do, as Damasio says, “very reliable” things. They’re not a mystery, unless of course, you grew up in this culture, and then you’re out of luck. Hah! I’ll be talking to a woman who teaches theater arts to disabled adults about my ideas for using actors to teach emotion recognition and management to people on the Spectrum. It should be interesting to see what can be done. Are you familiar with Michelle Garcia Winner? She is home-based up your way and might be a good resource for your upcoming work. A few years ago, a student in the Child Development classs I speak to recrutied me to speak to her Theater of Diversity class at SDSU. It is interactive and compelling, yet not about emotions and if budget and the same Professor are there, I think you’d be a great asset to that group. Say the word (feel free to e-mail me privately) and I’d be happy to connect you. Also, I have a personal request to incorporate your “laser” Chapter definitions in an eBook I am updating. It is called Walking through Life in Your Own Shoes! (tm) and has been around awhile. May I have your permission give the abridged definitions that you use in your TOC, to your credit? Hi Mo, thanks for telling me about Michelle – she’s very interesting. I’ve got to study her stuff! About the permissions: I think 500 words is a fair use limit, so you’d be under that if you’re just using the table of contents material. When you attribute, make sure to include the publisher and date of publication as well. Thanks. I’ve workshopped with Michelle initially for my own personal concerns of my son, yet find value in Social Thinking (R) and Perspective-Taking with my N.T. clients. I think YOU would actually be a huge benefit to her too. Thank you for your permission to include your definitions. If you’d like, I’d be happy to send that segment for your review, prior to the final save/print. Also, if you want to send me exact credit verbiage as you’d/Sound True would like it, I’m happy to do that too. Hi Mo, the verbiage is: Excerpt from The Language of Emotions by Karla McLaren, © 2010, Sounds True. Used by permission.